To solidify its position at the center of the industrial IoT (IIoT), GE Digital is going to the edge. That is, it's adding features to its Predix platform as a service (PaaS) to let industrial enterprises run predictive analytics at the network edge, as close as possible to data sources, whether they be pumps, valves, heat exchangers, turbines or even machines on the move. The main idea behind edge computing is to analyze data in near real-time, optimize network traffic, and cut costs. At its annual Minds + Machines conference this week in San Francisco, GE Digital, the software arm of industrial conglomerate GE, is offering an array of new applications and features designed to run at the edge network and let companies more efficiently and precisely plan service times and predict equipment failure. The new apps, which extend the Predix Edge platform announced at Minds + Machines last year, also are meant to connect information and operational technology (OT and IT) systems to better manage companywide assets, for example bringing data from the factory floor and inventory facilities into ERP and supply-chain systems that may reside in corporate data centers or in the cloud. As enterprises try to get a handle on the vast amount of data generated by IoT devices, some of the biggest names in tech are offering a variety of apps and cloud services to help. Offerings from IaaS (infrastructure as a service) providers include Amazon's AWS IoT, Microsoft's Azure IoT Suite and Google's Cloud IoT Core. Software from PaaS and app vendors include PTC's ThingWorx and Siemens' MindSphere. GE Digital's advantage is that it has what it says is the most comprehensive suite of IIoT apps and development tools running on its Predix platform, backed by 124 years of experience actually building and running a wide variety of industrial equipment. "While most software companies maybe can give you a view of what happened historically or plug into a VC (virtual circuit) connection and show you what’s happening with pressure flow and temperature, we actually have a lot of detailed knowledge about failure codes from our own designs and our manufacturing," said Eddie Amos, general manager for GE Digital's Asset Performance Management (APM) software business unit. "We have a lot of insight in terms of optimization because we operate this equipment -- and because we also service this equipment it really gives us a unique, 360-degree view of what’s going on, so that’s the reason we feel we’re unique in this space," Amos said. Amos also points out that GE is working with IaaS providers. Predix runs on AWS and this quarter it will also be generally available to run on Azure. "We look at Azure and AWS as infrastructure as a service and Predix is a platform as a service, so we can depend on AWS or Azure to provide a level plumbing and we can add value on top of that," Amos said. "What we really like about this is that our customers can have a choice of whether they want to run on AWS, Azure, or on-prem." Rather than send petabytes of raw data from industrial facilities and devices back to the corporate data center or the cloud, it's more efficient to process as much information as possible on site. Then, only the data needed by applications such as corporate asset, service and financial management systems need to be transmitted over the network. GE Data's data management tools allow for graphical representations of work flow and product lifecycles. Gartner predicts that by 2022, 75 percent of enterprise data will be created and processed outside the data center or cloud, GE notes. The ability to process and manage this data both at the edge and in the cloud, then, is essential for enterprises to to optimize their operations, GE says. To better process data at the edge network, GE Digital is offering enhancements to Predix Edge, including the ability to run the Predix Edge Manager on server hardware. Previously available only as a cloud service, Predix Edge Manager allows companies to support up to 200,000 connected devices from a single console. Another new app, Predix Machine, is designed to enable microservice-based applications to run at the edge on customers’ virtualized data center infrastructure or on server-class hardware. The Edge Manager and the Machine will be available in the first quarter next year while another new feature, Predix complex event processing (CEP), designed to allow faster and more efficient event processing at extreme low latency, will be available later this year. GE Digital also announced that its Operations Performance Management (OPM) software, now available for the mining industry, will be extended to other industrial sectors next year. OPM is an extension to GE Digital's APM software. OPM uses real-time and historical data as well as analytics to help customers make better operational decisions, GE says. The software provides, for example, an early warning if industrial processes deviate from plan, giving operators the data and the time needed to troubleshoot operational issues and take preventive actions. GE said that one mining customer (which it did not name) achieved a 5.5 percent increase in throughput while consuming 2 percent less power. Since buying ServiceMax for $915 million last year, GE Digital has been working to integrate the company's field service management (FSM) software with GE products and third-party tools. For example, artificial intelligence-enabled predictive analytics now integrate the Apache Spark AI engine to improve service time estimates. In addition, new application integration features let service providers launch and share FSM data with third-party mobile applications installed on the same device, and new scheduling capabilities allow multiple work orders to be linked to improve first-time fix rates and reduce the number of service visits. The FSM improvements are available now. Additions to GE Data's APM suite include Predix Studio, due out in the first quarter next year. The app sports a drag-and-drop graphical interface designed to let non-expert developers extend the GE software. "This will allow basically any citizen developer -- someone who's not necessarily a computer science grad by nature -- to come back and build and extend applications in a very safe and efficient manner within our code base," said Amos. 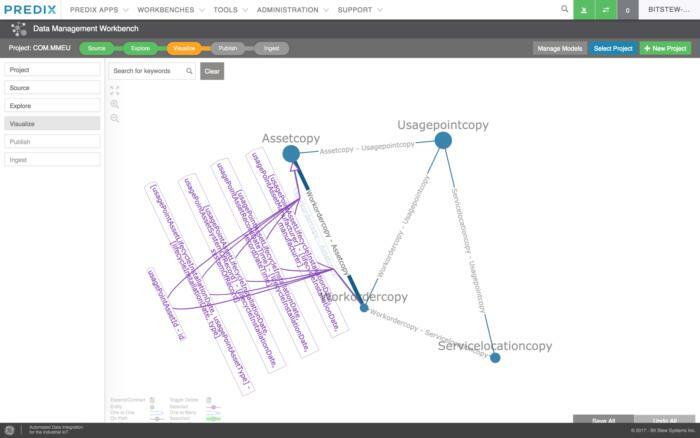 "You'll be able to take this tool right within our APM suite and extend it out, add additional data sources and do new and interesting things up and beyond what we provide out of the box." Also in the works and due out in mid-2018 is the Digital Twin Analytics Workbench, which applies a library of algorithms and templates to make it faster and easier for GE customers to build so-called digital twins -- virtual models designed to give companies insights about performance and operation of physical assets like aircraft engines. 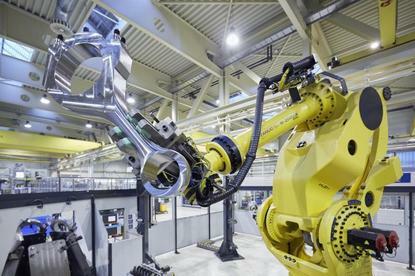 Digital twins grab data from product lifecycle management systems, machine data and ERP systems to measure, for example, deterioration of physical assets and performance anomalies. GE says that the Analytics Workbench will also help users implement machine learning capabilities that allow these models to improve themselves over time. Pricing on all these new apps varies widely, but GE Data's software is generally available on subscription models.